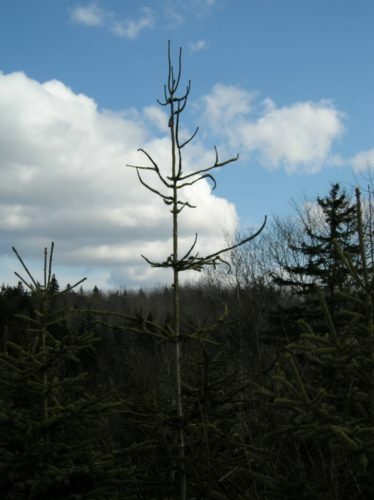 Picea glauca 'Scotia Spider' is an upright, open-growing selection of White spruce. It is unique and interesting with its snakelike growth habit, curious hook-like growth at terminal ends, sparse foliage and minimal inter-nodal branching, making it a unique centerpiece for smaller selections that surround it in the landscape. Scotia Spider has the potential to be a fast growing cultivar with specimens averaging 1-2' (.03 - .61m) of growth a year (20' [6.1m] tall by 6' [1.83m] wide after 20 years). This cultivar was registered through the ACS Conifer Registration program and accepted by the International Conifer Registry at the Royal Horticultural Society. William C. Journeay is officially recognized as both the originator (1991) and registrant (2011). It is currently being introduced through Kingsbrae Gardens, St. Andrews, New Brunswick, Canada and various private gardens. Picea glauca 'Scotia Spider' -- one of the first propagations growing in the Jouneay garden. 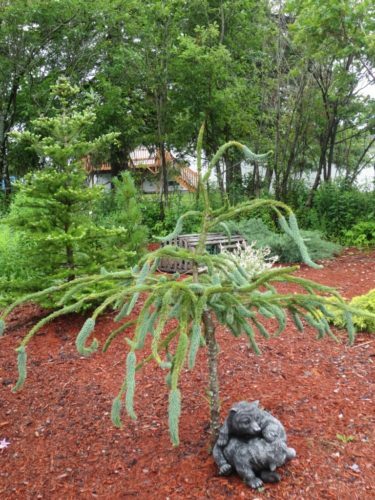 Picea glauca 'Scotia Spider' -- the original tree found in the wild in Nova Scotia, Canada.